First of all, let me thank you all for the stimulating discussions we’ve had this term in class. I’ve been gratified at the quality of discussions and the number of you who are regularly contributing to the discussion each class period. Driving home yesterday after our discussion of O’Brien’s Z for Zachariah and the 2015 film adaptation, I had some further thoughts that I thought I’d share. O’Brien’s book begins with Ann Burden in a state of balance. She’s comfortable in the house, she has a supply of food that comes both from the local store and the small garden she’s been working. She entertains herself with books and playing music. Granted, the tractor no longer runs because of the lack of gasoline, but Ann seems to have found a state of equilibrium without the comforts of modern technology. When Loomis comes onto the scene, this equilibrium is broken, and the central story (and conflict) of the book is arguably all about the implications of this rupture and how Ann deals with it and what she learns from the experience. As we discussed in class, Loomis might represent a patriarchal authority being imposed on the valley, or simply the hierarchical power structure of the adult, or perhaps even the reintroduction of “advanced” knowledge and technology (note how he enables Ann to once again use the tractor by manually operating the pumps and brings in the cutting-edge suit that protects from radiation). Whatever he represents, he disrupts the balance with the natural environment that Ann has struck after her family left the valley. In discussing the film adaptation, I noted that the introduction of Caleb, the young man not present in O’Brien’s book, could have been a ploy to develop a love triangle that’s been an oft-used trope in literature and film, especially young adult literature. Certainly the conflict that develops in the film between Caleb and Loomis for Ann’s affection (and, consequently, for the relative comfort and potential future that the valley can provide) brings a level of conflict that is not only more familiar to viewers but more palpable. Internal conflicts are much harder to depict in film as opposed to in a novel, and O’Brien’s book is almost entirely about the internal conflict Ann feels about Loomis and the future he does (and then doesn’t) represent. The screenwriters’ decision to bring in a third character is partly about externalizing that conflict, making it more present. But, in thinking about it more yesterday, I also think it’s consistent with the spirit of O’Brien’s work. If Z for Zachariah is primarily about the upset that comes into Ann’s life, then the film is pretty consistent with the book. At one point in the film, it seems possible that Loomis and Ann will be able to be a couple and perhaps begin a future for humanity–it’s almost as if the balance Ann had worked so hard to build before Loomis appeared will be restored and, perhaps, even strengthened given Loomis’ scientific know-how. But once Caleb comes on the scene, that balance is ruptured again and becomes even more imperiled: Caleb’s appearance brings out troubling aspects of Loomis’ character (who has been portrayed as gentler and more appealing than he is in the book), but Caleb’s something of an unknown as well and we can’t be any more confident that he’d be a suitable match for Ann. Two final thoughts about the adaptation. One, it’s significant that the showdown between Loomis and Caleb in the film comes in the context of building a water-wheel to bring electricity back into the valley (which is only alluded to as part of Loomis’ plans in the book). Here again we see the “invasion” of scientific knowledge into the natural balance of the valley, the same kind of knowledge that brought about the destruction that traps Ann in the valley and threatens her when she decides to leave. And, two, as I mentioned in class, I’m not sure what to make of the choice to cast Loomis as a different race from Ann and Caleb; is that to evoke historical stereotypes about race, or is it designed to make us more self-aware about how embedded those stereotypes can be when Loomis does turn out to be suspicious? In addition to the reading that I’ve asked you to do about multimodal texts, I’d like you to experience some that make use of the mode of interactivity or the gestural mode. These texts are often classified broadly under the category of “interactive fiction” and have a long history that parallels computers and video games. Most of these can be enjoyed within your web browser (although some are available as separate apps). I’d like you to experience at least two of these texts, and to spend at least 10-15 minutes with each of them (some are short enough that they can be experienced completely within that time frame). Two sites that you can visit and browse to choose texts based on your preferences include textadventures.co.uk, a site that features hundreds of interactive story-games to choose from. The games tagged Literature (see the choices available on the main screen in the Categories sidebar) will be very appropriate for this assignment, but you can really choose from any of the categories. A second site that hosts a number of stories is the Sub-Q Interactive Magazine which features mostly shorter texts that rely more on clicking links in the text rather than inputting text into a parser (see the note below). Zork (read/play it here): This is a classic story/game from the 1970s that features an engaging fantasy setting and emphasize puzzles-solving. In this story, you enter commands to control your in-story character. If it’s a little confusing at first or you’re feeling lost, check out the guide posted here (you can skim the introductory parts and the real action begins in section five). This is a full-length game, so you won’t complete the entire story, but you should get a taste for some classic interactive fiction. My Father’s Long, Long, Legs (read it here): In this very creepy story, you revisit your childhood home to check on the father you abandoned long ago because of his odd behavior. No commands to enter here, just links to follow as you experience the story. Some sound effects and some interesting light effects later into the story, but this is a quick one that shouldn’t take you longer than 10-15 minutes to experience. Invasion (read it here): Another creepy story, this one has you take on the role of a young girl being chased by a mysterious creature. It’s also short and features links rather than inputting text. Photopia (read it here): This one’s hard to describe, but it’s one of the more interesting pieces of interactive fiction I’ve experienced. When it first loads, you’ll be asked if you want instructions; I’d suggest answering “yes” and the resulting introduction will give you the background you need. You may not be able to finish the whole story in 10-15 minutes, but it’s well worth the ending to finish it. You enter text commands in this story to move it along. Creatures Such as We (read it here): Described as a philosophical romance, this story focuses in part on a game you’re playing (very meta, kind of like a game-within-a-game). It’s labeled as a “philosophical romance” and uses the “choose your own adventure” format of offering you a series of choices after each piece of the story. Also an app for Android and iOS. Most of these texts fall into two categories: those that ask you to input text as a way of directing your avatar/personality in the text and those that ask you to click on linked text to make choices and move to story forward. In the first category, you’ll usually see some kind of prompt (a carat “>” followed by a blinking or solid underline) or a text-entry box where you can type simple commands (such as “go north” or “take the suitcase”) to direct the actions of your character in the story. In the second category, the words/links you can follow will be highlighted in some way (often bolded or in a larger font); clicking those words will move the action of the story along. For stories in the first category, here is a handy PDF reference to give you some tips on how to play/experience these texts. I just finished a warm and insightful magazine piece (from The NYT Magazine) on Judy Blume. I’ll be honest up front here and admit that I never read any Judy Blume books as a teen, even though I knew about them, because I thought they were either girl books (in the case of books like Are You There God? It’s Me, Margaret or Forever…) or for little kids (as in Tales of a Fourth Grade Nothing or Superfudge). In retrospect, I find that kind of funny because I recall knowing that her books were controversial, and that typically would have encouraged me to take a chance on a book. Not in this case, I guess. OK, so it’s kind of in the middle of the week, but here are some thoughts and reminders for you. I enjoyed and appreciated the discussion yesterday on Hesse’s Witness. It’s intriguing to me that verse novels are popular for young adults (and I think readers, at least those that I’ve observed in classrooms, generally respond favorably to them) but not so common in the real of adult literature (that I know of, at least). Witness is a powerful example of both the genre itself and the potential of the genre to allow for complex, multilayered explorations of the human condition. As some of you noted yesterday, we don’t get to enjoy full characterizations in a verse novel like this, with so many narrative voices, and that might be less satisfactory for us readers. But we do get some significant insights into the condition of bigotry and the courage required to overcome that human weakness thanks to the broad number of voices. And that’s worth a lot, I think, in light of the challenges we sometimes hear to YAL that it can’t be complex as other forms. If you’re interested in the verse novel and would like to explore those that do provide stronger characterization, I’d recommend you look at Virginia Euwer Wolff’s Make Lemonade [HBLL | Amazon]. Another title that’s attracting a lot of attention right now is Kwame Alexander’s The Crossover [HBLL | Amazon]. Both feature a single narrator with a distinct voice; the former features a young woman who babysits for a teen single mom who’s struggling to get her life together, the latter features a young basketball player who tells his family’s story in verse. One last thing to note: I will be traveling next week and will have limited access to the Internet. I know the Keyword Project is due at the end of next week, so I’d suggest you get started thinking about the individual essay this week so I can help address any questions you have. I’ve posted links on the assignment page to a couple of model essays from last semester that I hope will give you a sense of my expectations for this piece (in addition to the explanation on the assignment page). Continue to think about the keyword you’d like to focus on; we started forming groups on Friday, but remember that all that’s fluid for the next little while. I was excited by the list we started gathering on Friday, as some of the terms you’re interested in looking at (like sexuality and steampunk and bleak lit) are terms that I think really need to be added to the wiki. Your inquiry project proposal is due this week on Wednesday; we’ll talk a bit more about that on Monday, but you’ll want to look over the topics on this site (in the Resources section of the site) for some possible topics. But I think our discussion Friday of the history of young adult literature and even the issues we explored as we interrogated the terms might provide some ideas. I look forward to hearing on Monday about your experiences immersing yourself in the cultural construct of the teenager. Last semester I watched some of the show “The 100” (on the CW network) as part of my research and was reminded that these actors are older young adults (usually in their early or mid-20s) playing the role of teenagers. And often, as in the case with this show, they’re engaging in some pretty adult behaviors and conflicts. That’s another wrinkle, I think, in our discussion of how media influences our ideas of what it means to be a teen and how the adolescent experience is portrayed. Thanks for a great opening week and I am really looking forward to this (sadly, short) term together! This weekend’s New York Times featured an interesting article in the business section that details the work of Julie Strauss-Gabel, an editor at Dutton who has been part of the success of recent big titles and authors in YA literature (including John Green and Allie Condie). Green, quoted at length in the piece, actually gives her credit for helping him improve the ending of The Fault in Our Stars. Most authors will tell you how important a good editor is, and this article describes in interesting detail the role that Strauss-Gabel has played in the process of writing and publishing. For those of you interested in these aspects of YAL, I’d suggest you give this article a read. The article is also an important read because it discusses the shift in YA literature that has it gathering increasing attention on the part of adults. We begin the semester in this class talking about the challenges in defining the terms in this field: What exactly is a young adult? And what counts as literature? And how are these terms influenced by the culture they exist in and the contexts in which they’re used? The difficulty in defining some of these terms is what led to me asking you to collaborate on the keyword wiki, which I think is off to a great start. Neil Gaiman is a popular author across many genres and audiences, and some of his work for young adults is the best I’ve read. 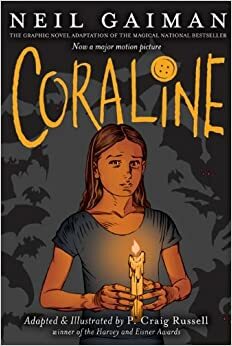 I found Coraline to be chillingly spooky, on par with some of the creepiest and most unsettling horror I’ve read for adults (I’ll never forget that first encounter with the other mother and her glossy, black button eyes). 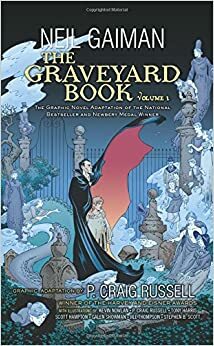 And his Graveyard Book with its unassuming orphan child hero, Nobody Owens, was a delightfully original take on some fairy tale stories. So I had high hopes for the graphic novel adaptations; this is a format that I’ve come to really enjoy personally. 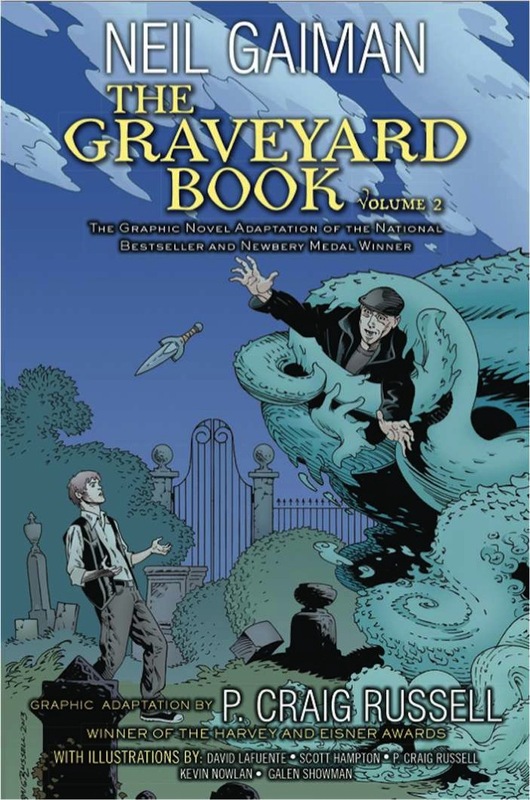 The artwork in all three adaptations (The Graveyard Book is divided into two volumes) is appealing and clean; I found the work in The Graveyard Book to be particularly imaginative (although the fact that the first volume is drawn by a variety of illustrators is a bit jarring at transitions from one section to another). It’s interesting in this case to read these volumes because I’ve never before read graphic novel adaptations of pre-existing stories (except some Shakespeare and classical texts like The Odyssey, all of which have hewn pretty closely to the original story). I picked up Katherine Howe’s novel Conversion on something of a whim, mostly because whatever I had read about described its link to the Salem Witch Trials and Arthur Miller’s play, The Crucible. Both are topics/texts that are frequently studied in high schools, so I figured this book might provide some nice connections in the context of young adult readers. I was surprised at how engaged I became in the story and the characters. Conversion is really two stories in one: The main story is told through Colleen Rowley’s eyes while a secondary story reveals the truth behind the witch scare in Salem, Massachusetts in in 1600’s. Colleen lives in Danvers, MA (the town formerly known as Salem Village–renamed for obvious reasons, I guess) where she attends an elite private all-girls school; the focus of the story is on an unidentified “illness” that strikes the school, beginning with a few girls and slowly infecting more and more of the school’s population. Interspersed with chapters about the mysterious illness are chapters that take place in Salem Village, told from the perspective of Ann Putnam, where she confesses the true events and motives at work in the girls who were the center of the original Salem witch scare. 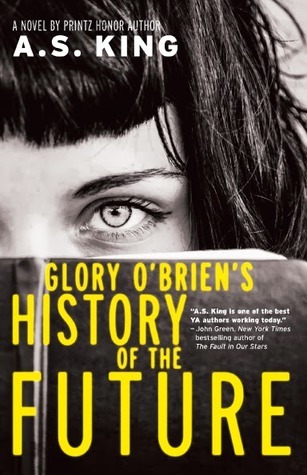 The title of A.S. King’s book, Glory O’Brien’s History of the Future, with its inherent paradox, should suggest to you that this a book that will be difficult to categorize. And that’s true, but rather than turning out a muddled mess, this book is a powerful exploration of what it means to move through a liminal time in adolescence: graduations from high school. In King’s book, Glory O’Brien is on the cusp of adulthood as she’s graduating from high school–but she’s at a loss as to what to do with her life. One night, she and a friend drink the dried remains of a bat and find themselves with the power to see the future. What Glory sees is reminiscent of dystopian works like Atwood’s The Handmaid’s Tale, a world where a new civil war breaks out over the rights of women and their proper role in society. Glory decides to write the “history” of this war as she sees it revealed piece by piece in visions of the future she has while associating with people in her town.